Amazon.com Price: $18.95 (as of 2019-04-19 07:27:43 GMT) Product prices and availability are accurate as of the date/time indicated and are subject to change. Any price and availability information displayed on Amazon.com at the time of purchase will apply to the purchase of this product. * These are the lightest high-quality carabiners on the market at only 21 grams (0.75 ounces). Put it in the palm of your hand and you will barely feel that it’s there. * Absolutely no sharp edges making these the safest ‘biners to use with your hammock, straps, and more. It will not snag! * Deceivingly strong! 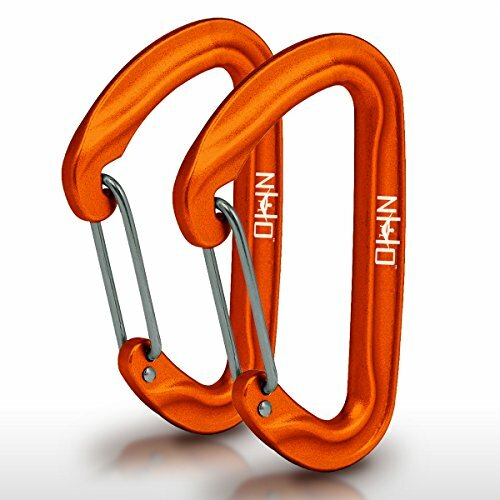 The load bearing rating on these carabiners exceed the maximum weight of your hammock and straps (400 – 500 pounds). Each ‘biner is rated just over 17 kN, which is equivalent to over 3,500 pounds of force. For mountain climbing choose a carabiner rated over 24 kN. HangTight carabiners come with a lifetime warranty against material and workmanship defects and world class customer service… no strings attached. Just contact us and we will make sure you are 100% satisfied. EXTREMELY LIGHTWEIGHT BUT STRONG – Each carabiner only weighs 21 grams (0.75 oz). Rated to withstand over 3500 pounds of force (17 kN). Perfect for use with your hammock suspension system, clipping camping gear and accessories to your backpack, as a keychain, and many other utility uses. SET OF 2 carabiners. COLOR: Anodized orange.